The kitchen is definitely the most popular place to hang out at the Marley house. There you’ll find music, family, laughter, conversation, and of course lots of delicious, fresh, and pure food being chopped up to go into a salad or pot or simmering away on the stovetop. Life is one giant celebration, right? And we are great at finding any reason, big or small, to gather friends and family for a good party. Some parties, though, well, they are for adults only! So put the kids to bed or send them to a friend’s house because it’s grown-up time. When I want to let loose and just have some fun, I’ll enhance a dish (or three!) with some Herb — just enough to get our spirits high and bright, not enough to put us all into a trance … what fun would it be if we were all just asleep on the sofa? Whether I’m cooking “clean” or with a kick, my food often has an island beat to it because those are the flavors I grew up with and that I crave. Jamaican culture — from food to music — is alive. It is bright and fresh and bursting with spice and a feel-good positive attitude. Anytime you put a Jamaican dish on the table it’s like a party already, so when you add an Herb enhancement to the recipe, it kicks up the decibels that much more. Using Herb — whether you smoke it, vape it, or eat it — is, to me, just another part of eating clean and good. Herb is natural — it’s a plant from the ground that is as pure as a bunch of thyme or parsley. While edibles are fun, they also are really so much better for you than drinking a cocktail, which can be loaded with all kinds of who-knows-what ingredients. Herb doesn’t impact your liver and it’s not loaded with calories or sugar, so as far as intoxicants go, it’s a nice and natural ingredient you can actually feel really good about putting into your body. In this book, I’ll teach you how to control how much you add to a dish so you can control your high as easily as choosing whether you’ll have one glass of wine or two. My kitchen is casual. Check your ego at the door! Here is a place to be free and happy and just let go. You’ll often find people gathered around the cooktop eating some seasoned rice straight from the pot or ripping off the crispy edges of a lasagna before it has a chance to hit the table. I love entertaining — from big gatherings on weekends to cozy dinners with my closest friends. This cookbook truly reflects the way I eat — an eclectic and mostly vegetarian mix of vegetables and grains that’s as good for your body as they are for your spirit and soul. My daddy chose to live his life in peace, happiness, and in unity with others. We ate a lot of fish and vegetables at home, though sometimes when at a friend’s house I’d eat what they were serving — maybe curry goat, curry shrimp, brown stew chicken, oxtail with butter beans — I threw down when I got out of the house (forgive me, Mom and Dad, but confession is good for the soul). Since I was eighteen, I’ve eaten a mostly vegetarian diet. In part I was inspired by my grandmother and namesake, Cedella, who was rarely sick and always just glowed and was radiant. 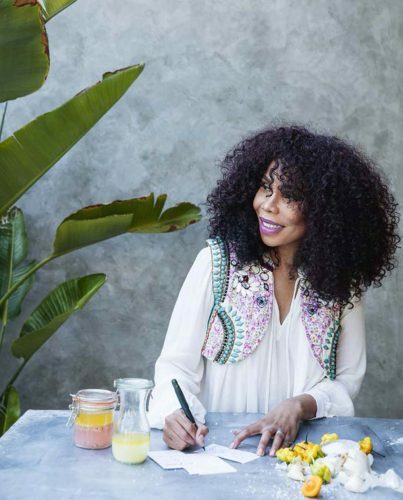 I definitely feel the difference in my spirit and energy when I fill my diet with as many organic fruits and vegetables as I can and if using dairy products and eggs, I always buy organic, antibiotic-free, and cage-free. I know a vegetarian diet is not for everyone, though, so the recipes in this cookbook reflect that philosophy. You’ll find a few recipes here and there calling for saltfish, fried fish, or pan-cooked escovitch-style fish as well as jerk chicken (always use humanely raised and preferably organic, please!). My parents believed in whole and natural foods — Dad was drinking green juice decades before it was available in just about every grocery store! We ate very little sugar and did lots of cleanses and drank tonics to clean our blood and our insides. They believed in eating for health, and we always ate lots of nutritious home-cooked meals, many that came from our own garden. Mom loved going outside and picking fresh mint for Daddy’s morning tea. For Saturday dinner, she’d whip up her Ital stews (Ital deriving its name from the word “vital,” with the letter “I” being front and center to symbolize the connection to nature and to one’s self, with the goal of eating as cleanly as possible to increase your life energy). On Sundays, the family would gather for dinner around two o’clock. This was our time together, our moment to enjoy laughter and music and a little “reasoning” with Daddy and Mommy. I’m sure, when it was time to chill with friends, my parents probably experimented with adding Herb to food. Forty years ago, they most likely did what everyone else did and chopped some bud up and added it straight to a curry or stew. 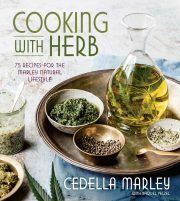 I think Daddy would be excited to see the evolution of how people cook with Herb now, how far cooking with herb has come (and how delicious it can be! ), and how much fun and enjoyment people get when they experience an Herb-spiked dish. I’m really excited to share these family recipes with you and finally to have the opportunity to publicly marry them with Herb. I can eat patties hot, cold, for breakfast, on a hike, as my dinner . . . you name it! The meat patty is like the Big Mac of Jamaica — actually, along with jerk chicken, this is really like our national dish! It’s so perfect as a way to pass out herb in a fun, neat, and tidy package or tuck into your bag for the movies (hey, we all do it). You won’t find many burger shops or pizza parlors on the island but patty shops are everywhere. I used to go with Daddy to a place in Half Way Tree in Kingston for patties. He loved them because they were a bit different, stuffed with corn and peas (no meat since daddy was a vegetarian), and they fried their patties instead of baking them. I like mine on the more traditional side, except instead of a meat filling I stuff mine with a veggie mince (a crumbly ground meat substitute available in the freezer section where you find veggie burgers — or if you can’t find it, just use crumbled veggie burger instead). The sign of a great patty is when you bite into it the filling almost bursts out of the sides, so don’t hesitate to stuff these full up. 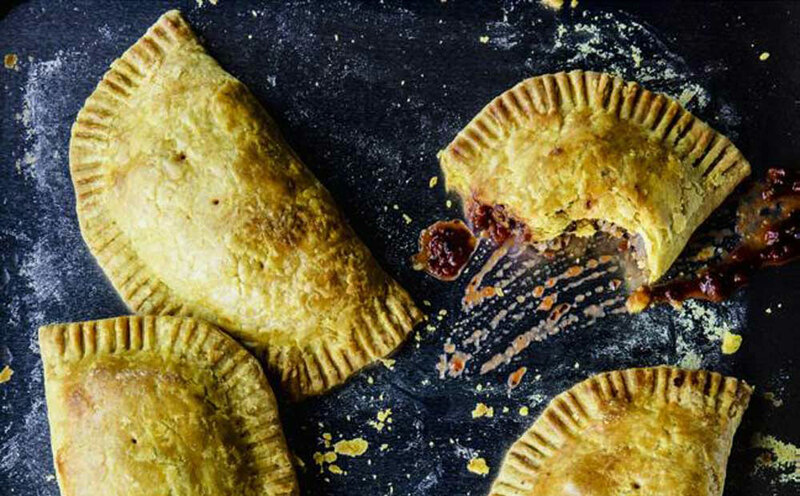 The patty crust is made with coconut milk and curry powder, which gives it that trademark yellow color, but you can use store-bought pie dough or puff pastry instead if you’re short on time. You can use a 3- or 4-inch round cookie cutter to stamp out smaller pieces of dough for more appetizer-size party bites. 1. Make the pastry: Combine the flour, curry powder, turmeric, and salt in a food processor and pulse to combine. Add the solid coconut oil and pulse for eight 1-second pulses to work it into the dry ingredients. Transfer the mixture to a large bowl and add 7 tablespoons of the water, using your hand to bring the ingredients together into a smooth ball (add the extra tablespoon of water if the dough seems dry). Turn the dough out onto a large sheet of plastic wrap and knead 2 or 3 times to get it to come together, then press it into a round about ½ inch thick. Wrap in plastic and refrigerate for at least 30 minutes or up to 2 days. 2. Make the filling: Heat 1 tablespoon of the coconut oil in a large skillet over medium-high heat. Add the scallions and bell pepper and cook, stirring occasionally, until they start to brown, 2 to 3 minutes. Stir in the garlic and cook until it is fragrant, about 30 seconds. Stir in the thyme, tomato, ½ teaspoon of the salt, and the black pepper. Reduce the heat to medium and cook until the mixture is thick and no liquid remains in the pan. 3. Add the veggie crumbles and Scotch bonnet and continue to cook, stirring often, until the crumbles are heated through and the mixture starts to brown, about 10 minutes. Stir in the CannaOil, then transfer the filling to a medium bowl and set aside to cool (if you use warm filling, the pastry will be too soft to shape). 4. Preheat the oven to 400°F. Line a baking sheet with parchment paper. 5. Take the dough out of the refrigerator and let it sit at room temperature for 5 to 10 minutes if it has been chilling for more than 30 minutes. Unwrap the dough and place it on a surface lined with plastic wrap or parchment paper. Sprinkle the top with a little flour and roll the pastry into a sheet ¼ to 1/8 inch thick. Use a 5½- to 6-inch-diameter bowl turned upside down to press 4 circles into the pastry. Then use a knife to cut out the rounds. Place the dough rounds on a the lined baking sheet. Bring the scraps together and re-roll them, then cut out 2 more rounds for 6 total. 6. Whisk the egg with a pinch of salt and 1 tablespoon water in a small bowl. Divide the filling among the pastry rounds, placing it in the center of each, and patting it down a little bit. Use a pastry brush to brush the edge of each pastry round. Fold the top over to meet the bottom and press the edges together to seal. Use a paring knife or a fork to make a slit or poke a few holes in the top of the patty, then use the fork or your fingers to crimp the edges. It’s not uncommon for Jamaicans to stop at a patty shop for lunch or after work and buy a patty stuffed into coco bread for a kind of double-crusted patty sandwich. Coco bread is similar to Wonder bread–it’s sweet and extra tender since it’s made with coconut milk. You can find it in Caribbean markets and maybe even sold stuffed with a patty at a Jamaican restaurant.